Construction of the dual high-rise project that&apos;s been dubbed the "Twin Towers" is ahead of schedule thanks to a mild winter and is expected to be complete in the fall. LOGAN SQUARE — A Logan Square affordable housing activist group is taking its fight against a planned high-rise development to the bank. 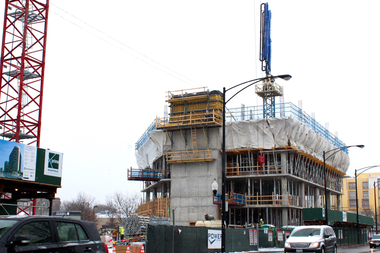 We Are/Somos Logan Square plans to march to Associated Bank in the West Loop with hopes of brokering lower rents at the dual towers project that is currently under construction on Milwaukee avenue at Belden avenue. "We can't stop the project, we know that," said Michael Saelens, a spokesman for Somos Logan Square. "We want to make them aware that this is what's happening with the money you lent out." The protest, scheduled for next Friday, is the latest in a series of efforts the group has conducted to draw attention to the gentrification of the neighborhood and perceived negative effects they say the luxury rental units will have on Logan Square. Namely, pushing long-time residents out by rising property taxes and the assumption that the buildings and their higher-than-usual rents for the neighborhood will cause rents of other units in the area to rise. The bank loaned the developer $45.8 million for the twin building project. He said the activist group wants the developer to offer at least 30 percent of the housing for people who earn 30 percent of the area's median income. That request is much higher than what the city's affordable housing ordinance requires of developers, which is to make 10 percent of the units affordable or pay into a fund that will pay for affordabl housing elsewhere in the city. The developer of the project is providing 10 percent of affordable units in the two towers. The protest is scheduled for 1:30 p.m. March 18.